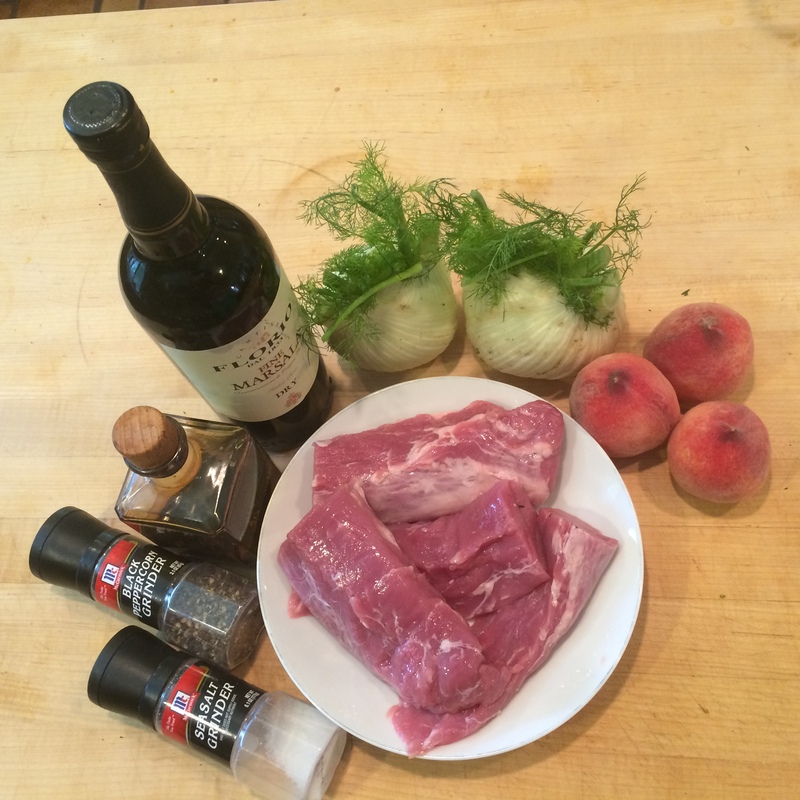 Pork tenderloins are usually sold vacuum packed in multiples of two – hence the recipe for two tenderloins. Pork tenderloins really are “the other white meat”! They are very low in calories with 4 ounces having only about 160 calories with very little fat and a lot of protein. This recipe will yield about 6 servings. Cut each tenderloin in 2 or 3 pieces and sprinkle them with salt & pepper. Heat the olive oil in a skillet until fragrant. While the oil is heating, dust the tenderloin pieces with flour. Brown the tenderloin pieces in the olive oil, turning them over once or twice to brown them completely and seal in the meat. While the meat is browning, cut the fronds off the fennel bulbs and slice off the bottom to clean it up. Cut the fennel bulbs into ½ inch slices. Set aside. Peal the peaches and slice. 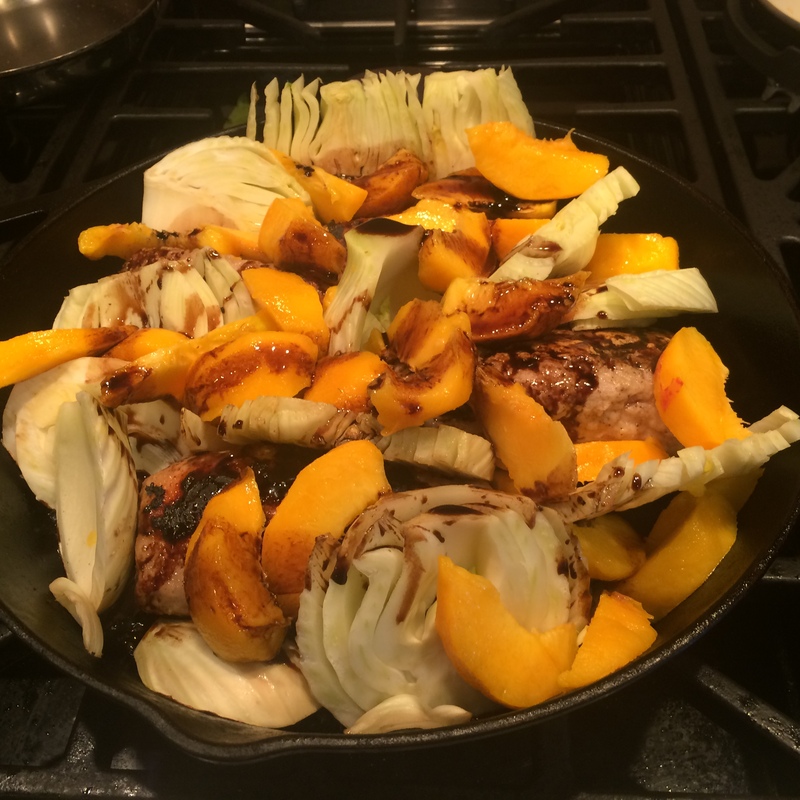 Add the fennel and peaches to the pan arranging them around the meat. Add the balsamic vinegar and the Marsala. Cover the skillet and place it in pre-heated oven. Bake for an hour and a half (1 ½ hrs). The liquid should yield a very thin “sauce”. You might need to check the pan after about an hour or so to make sure you do not need to add any more liquid.